Musk posted the update on Twitter late Saturday, and he confirmed the next try to recover the Falcon 9’s first stage booster will come in two months. Cause of hard rocket landing confirmed as due to slower than expected throttle valve response. Next attempt in 2 months. The 14-story booster stage appeared unsteady as it approached SpaceX’s landing platform in the Atlantic Ocean after launching a few minutes earlier from Cape Canaveral on April 14. The Falcon 9’s upper stage continued into orbit with a commercial Dragon supply ship en route to the International Space Station, and the rocket’s first stage flipped around at the edge of space to begin a propulsive descent back to Earth. Nine Merlin 1D engines — arranged in an “octaweb” configuration — are mounted to the base of the Falcon 9 rocket’s first stage. A subset of the engines fired two times for “boostback” and “entry” maneuvers to aim for the ocean-going landing target positioned about 200 miles east of Jacksonville, Florida. The center engine then ignited for a landing burn to slow down the rocket’s descent in the final seconds before touchdown. The booster made an on-target descent to the platform, which SpaceX calls an autonomous spaceport drone ship. But video recorded by a nearby aircraft showed the rocket trying to correct itself just before landing, and the booster did not settle straight down onto the football field-sized barge. The rocket instead landed with lateral motion, and it briefly wavered before toppling over with an explosive blast that scattered debris across the ship’s deck and into the ocean. The landing came closer to full success than previous experiments by SpaceX, which has programmed its boosters to land in the ocean several times with precision and gentle speeds. 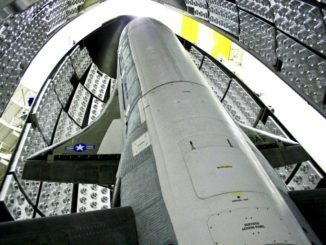 Before April 14, the company’s last descent to the barge was in January, when the first stage’s aerodynamic fins prematurely ran out of hydraulic fluid, causing the rocket to crash on the drone ship at an angle. 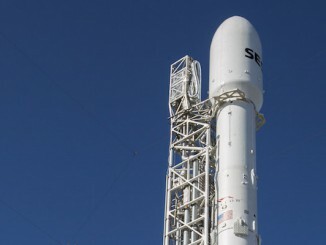 Before last week’s liftoff, Musk put the chances of a successful landing at about 50 percent. 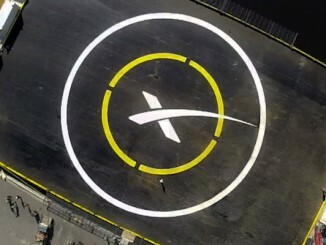 With more tries planned before the end of the year, Musk predicted an 80 percent chance of sticking a landing in 2015. SpaceX hopes to recover Falcon 9 rockets, refurbish the booster and its engines, then fly the first stage again on future launches. Such an achievement would drastically cut the cost of launching satellites, according to Musk. The recovery technique has never been attempted before. “At 14 stories tall and traveling upwards of 1300 m/s (nearly 1 mi/s), stabilizing the Falcon 9 first stage for reentry is like trying to balance a rubber broomstick on your hand in the middle of a wind storm,” SpaceX officials wrote in a description of the rocket landing maneuver on the company’s website. The next launch of a Falcon 9 rocket set for April 27 will deploy a nearly five-ton communications satellite into orbit more than 20,000 miles above Earth, requiring nearly all of the booster’s propellant reserve. Another resupply flight to the International Space Station is scheduled for June 19, and its destination in low Earth orbit will leave enough fuel to try another first stage landing attempt.